Roses are the most beautiful, gentle and romantic flowers and they are so pleased with not only the bouquet, but also on the skillfully painted picture. Learn to draw flowers is not so difficult – with the help of brushes and paints after some practice you will easily be able to draw a beautiful rose, and then to improve their skills, achieving maximum vitality and freshness of the painted flower. Take a sheet of thick paper for drawing and focusing on the photo of this rose, sketch the contours of flower slim pencil. Repeat the outlines and curves of the petals, try to make a drawing spontaneous. Now take the flat brush and gouache. Dial on flat brush and a little zinc white top pattern thin translucent layer of liquid paint, through which will come caused the outline with a pencil. Now type in the brush a little dark red gouache and light uneven strokes to paint the background around the flower. At the edges of the flower background needs to be more intense. Below the flower is green paint brush large brush strokes the main outlines of the leaves. After that, look at this rose, which you fantastic picture. Determine which parts of the flower are shaded the most and which the lit. With a rich mix of brown and ochre, set a line of shadows on the petals, and then begin to paint the petals with different pastel shades. For this mix the right shade of yellow, pink or orange, with white zinc. Carefully coloring the petals, try to make smooth transitions between the colors, blurring them with a brush. Relatively dark areas of petals color of ordinary paint, and the paint fragments of the same shades, but with a lot of added white. 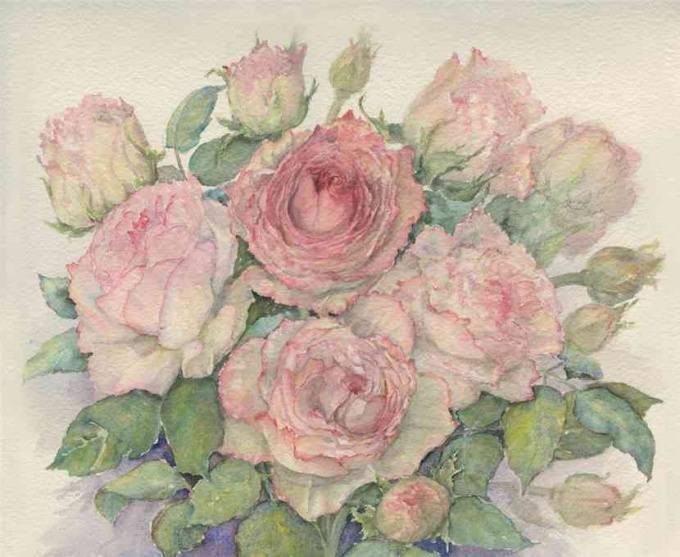 In order to identify areas of cold color on the lower petals of the rose, add a bit of blue gouache paint in General. Then spread some liquid white with a touch of ocher and evenly coat with this color the whole picture. Work through the shadows, lighten if necessary, flare, modify the shape of petals and their edges using a fine brush. Also work on the main background of the shadow cast flower Bud.